Tags: Capri, Ferozi, Kameez, Party, White Smoke. Ferozi pure chiffon sleeveless shirt with stand collar having ornamental embellishment on neckline. 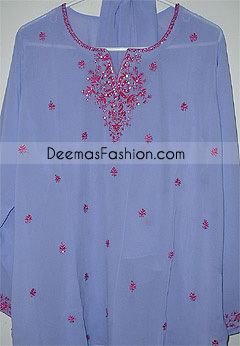 Embellishment work includes mostly silver embroidery using tilla, kora, dabka, crystal, stones, beads etc. Fully lined and finished with silver piping.